Fusion isn't a new trend in Morocco, where the cuisine is a blend of Mediterranean, Arabic, Jewish, Persian, West African, and Berber influences. Meals range from the diffa, an elaborate multicourse feast featuring couscous and grilled meats, to quick brochettes (kebab) from a roadside stall. Produce is seasonal, grown locally and typically without chemical pesticides or fertilisers. 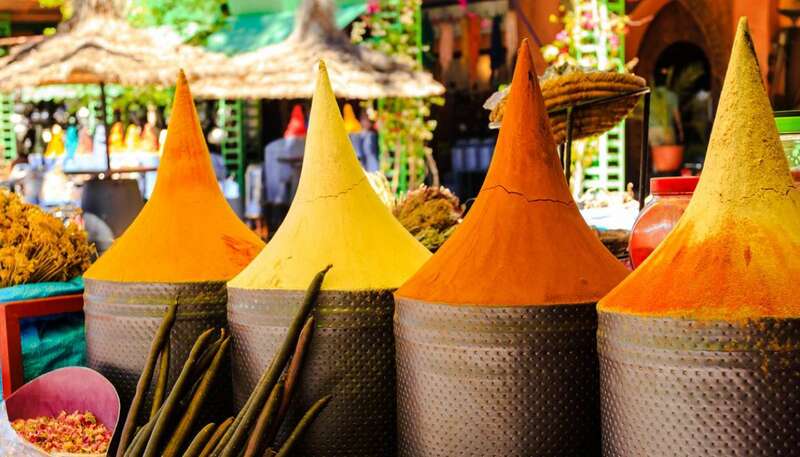 Tagines, the fragrant stews of meat, vegetables or fish, are named after the distinctive conical earthenware vessel they’re cooked in, and are a Moroccan main staple. Flavours revolve around a subtle array of spices, and every spice shop traditionally has its own secret ras el hanout spice blend recipe. Restaurants range from buffet diners to high-end establishment serving gourmet fare. Many now offer à la carte menus in addition to traditional three-course fixed-price dinner menus. Restaurants in cities and large resorts are cosmopolitan, featuring a good selection of cuisines, including typical Moroccan fare, plus French, Italian, Spanish and fusion dishes. 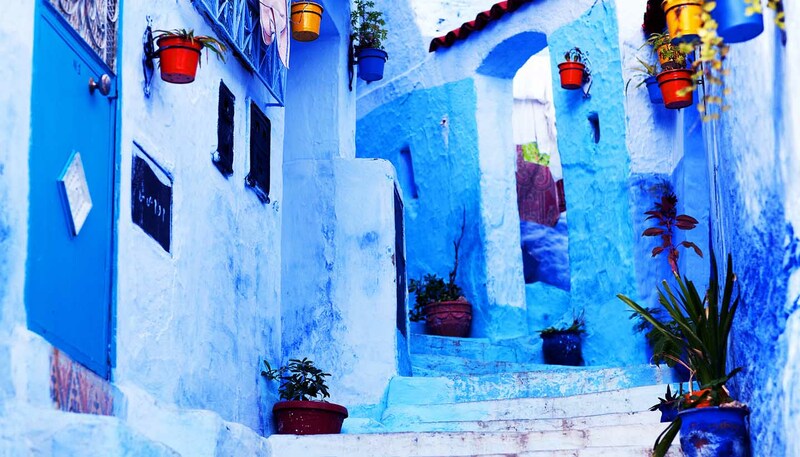 The best way to experience the true flavour of Moroccan cuisine, however, is to sample the street food. Djemaa el Fna square in the centre of Marrakech sees an explosion of pop-up food stalls after dark, and most other cities have their own foodie quarters. Scrumptious local specialities such as almonds, olives, and a rainbow array of spices can be found in souks across the country. • Harira (a spicy tomato-and-lentil-based soup). • Pastilla (a traditional Andalusian pie typically filled pigeon-meat, layered with flaky dough and dusted with cinnamon and sugar). • Couscous (a savoury semolina dish cooked with local vegetables and/or meat). • Tajine (a rich, fragrant stew, with some combination of lamb, chicken or fish with onions, olives, almonds, tomato, herbs or dried fruit). • Mechoui (slow-roasted stuffed lamb or beef). Laws on alcohol are fairly liberal (for non-Muslim visitors) and bars in most tourist areas stay open late. Wines, beers, and spirits are available to tourists. Muslims are forbidden to drink alcohol. By law, no one is allowed to drink alcohol in view of a mosque or during Ramadan, although tourist establishments sometimes flout this rule. Locally produced wines, beers, and mineral waters are reasonably priced, but imported drinks tend to be expensive. Tipping waiting staff is expected (if service is satisfactory), usually up to 5 dirams on small bills, and around 10% for larger bills. • Mint tea (aka 'Berber whiskey', a strong green 'gunpowder' tea mixed with fresh mint and heavily laced with sugar). • Coffee (French press, espresso or Turkish style). 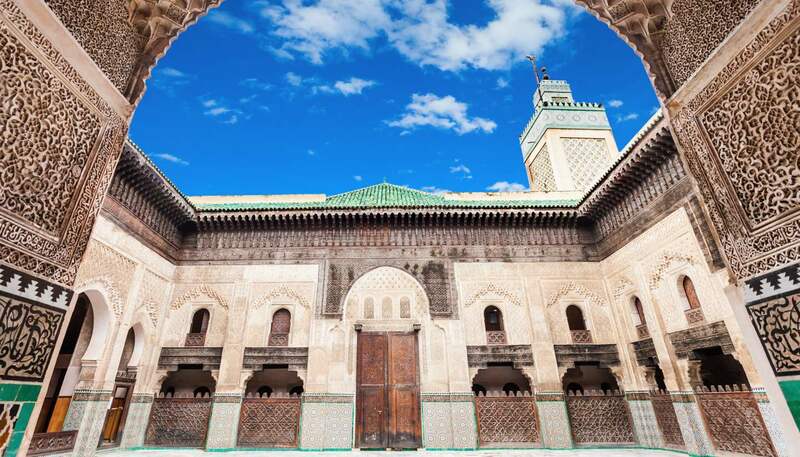 Snake charmers, magic potions and hidden palaces: Marrakech brings the most outlandish travellers' tales to life. 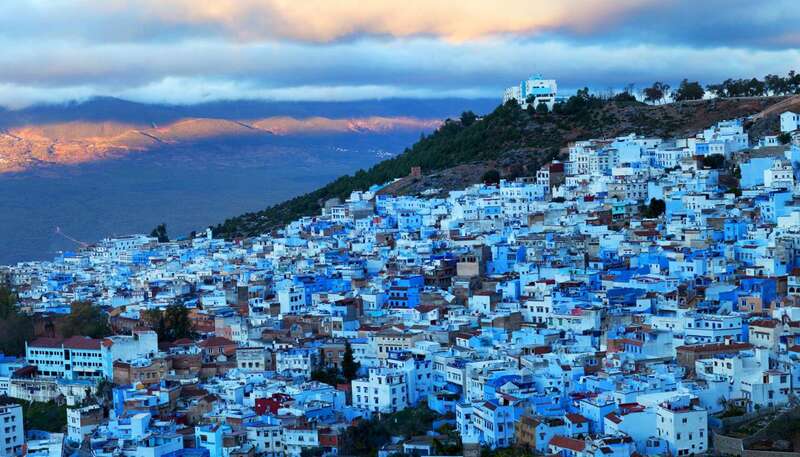 In an ancient town painted almost entirely blue, all the locals are smoking the green stuff. Donald Twain finds out where it's grown and sees, up close, how it's made right for the pipe.